Here's a few of the Chefs' personal favorites! Fire up the BBQ and check out our Grilling Tools! These recipes are Professional Chef Recipes! 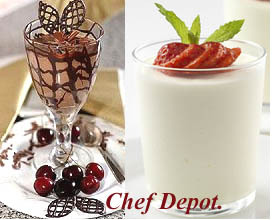 The recipes are copyrighted by Chefdepot.com, chefdepot.net and Chef Depot Inc., and/or the Chef that created the recipe, these recipes are for personal use only. Try these recipes and return often (bookmark our site)! New Recipes are added weekly! Chefs and Gourmet Cooks. We offer the highest quality cutlery and Chef supplies at the lowest prices! Scales, Thermometers, Diamond Sharpeners, Knife Blocks & Storage, Cleavers, Saffron, Vanilla Beans, Kitchen Carts, Knife Sets, Scissors, Cake Molds and more. We have the perfect gift for every Chef and Cook! Chef Tools & Products click here! Chocolate Pecan Pie with Vanilla! Lemon Walnut Sour Cream Pound Cake! Holiday Cheer from Chef Emeril Lagasse! Ginger Peanut Butter Vanilla Cookies! Learn how to make fast Coleslaw Salad? Just watch the video! All items used in the videos are in stock. Click Here for the Chefs Mandoline! Click Here for the Chefs Porsche Knives! Notice the Chef is using a NSF Maple Cutting Boards, used in all pro kitchens around the world! And one of our USA made NSF stainless steel prep tables! Chef reviews some of our Chefs Mandolines! Click links. Click Here for the Chefs Porsche Knives! Notice the Chef is using a NSF Maple Cutting Boards, used in all pro kitchens around the world! And one of our USA made NSF stainless steel prep tables! Ever wonder how to make your own Sushi? Order our Sushi Making Kit, it has a step by step recipe book and everything you need (except fresh fish). This is the best kit, gift packed and made in USA. 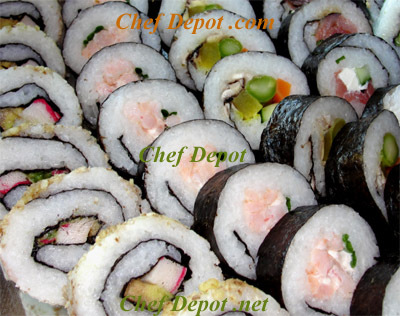 Click Here for the Chefs favorite Sushi Knives! Notice the Chefs are using a NSF Maple Cutting Boards used in all pro kitchens around the world! And one of our USA made NSF prep tables! Our archives contain millions of recipes. We are typing fast! Visit often! Millions of other recipes are available on our links page! Please bookmark this site and return to Chef Depot! Share our site with your friends!